The Circulatory system is an organ system consisting of the heart, blood, and blood vessels, that helps maintain homeostasis (e.g., regulation of temperature) and transport life-giving oxygen, nutrition, and hormones to cells throughout the body and toxic waste products away. It is also known as the cardiovascular system (Kardia means heat in Greek and vasculum means small vessel in Latin). There are two different types of the circulatory system: open circulatory system and closed circulatory system. Most vertebrates have closed circulatory systems, whereas most invertebrates have open circulatory systems. Open circulatory systems are simple. Blood and tissue fluid are commingled and pumped by the heart through the vessels to all parts of the body. They go back to the heart through different means. Arthropods and mollusks have the open circulatory system as with some other invertebrates. Arthropods have ostia, little valve openings that allow the tissue fluid to go back to the heart. Mollusks do not have ostia, but they have open vessels that help the tissue fluid return to the heart. Closed circulatory systems separate the tissue fluid from blood. The heart pumps blood into the vascular system to send everywhere in the body. Vertebrates and some invertebrates have closed circulatory systems. The earthworm is an example of an organism with a closed circulatory system. When the heart (five pairs of connecting vessels) pumps blood, blood transfers from anterior end to posterior end through ventral vessels, which carry oxygen, nutrients, and wastes. Dorsal vessels allow the blood to return from the posterior end to the anterior end. The closed circulatory system has significant advantages over open circulatory system. The blood can transfer faster in the closed circulatory system. Therefore, oxygen and nutrients get quickly where they are needed and wastes quickly from where they are not. Specialized cells can help carry hormones or nutrients. They stay in the vessels, and leave them where they are needed. The blood and the tissue fluid can be distinguished easily. Because the closed circulatory system can transport oxygen, nutrients, and wastes rapidly, the organisms can maintain high metabolic activities. Some organisms, especially simple aquatic animals, do not have circulatory systems. The cells of such organisms are close enough to the surface of the organism to interact with the external environment directly. Arteries are the vessels that carry blood away from the heart, veins conduct blood back to the heart. 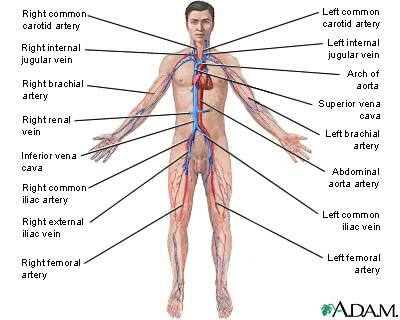 Arteries branch into smaller vessels called arterioles, which then branch further to form capillary beds. Capillaries are the vessels that allow the blood and the tissue fluid to exchange materials. The blood is transported back to the heart from the lungs or the body by the venous system. After materials are exchanged, the capillaries ultimately merge to form venules, which then merge in turn forming the much larger veins. Veins then deliver blood to the heart. The blood from the upper part of the body returns to the heart through the superior vena cava. In contrast, the inferior vena cava transports the blood from the lower part of the body to the heart. Both vena cavas end at the right atrium, but they enter different places. The superior vena cava enters from the top and the inferior vena cava enters from the bottom. There are three types of hearts: the two-chambered heart, the three-chambered heart, and the “human heart.” Types of the heart are distinguished by the number of chambers in the heart. The heart has right and left sides and both sides have an upper chamber (atrium) and a lower chamber (ventricle). The atrium collect the blood, and pumps it to the lower chamber. The inlet valve and the outlet valve prevent the blood from backflow. A beating heart is heard when the valves are closed and opened. The main function of the heart is pumping the blood. By pumping the blood, wastes (carbon dioxide) from the body can be removed from the lungs and oxygen and nutrients can be delivered to all of the body. First, the right side of the heart pumps the blood to the lungs. Then the left side of the heart sends the blood throughout the body. Blood from the body passes through the right atrium and goes to the right ventricle, when it relaxes. When the right ventricle is full, the right atrium contracts. Contracting the right atrium sends the blood into the pulmonary arteries through the pulmonary valve. Oxygen from the lung moves through the pulmonary veins to the left atrium. When the left ventricle contracts, the blood goes to the aorta through the aortic valve. Oxygen is moved by this process to all of the body except to the lungs. The cardiac cycle is when two ventricles contract and relax. When the ventricles contract, it is called systole. When the ventricles relax, it is called diastole. The heart makes sound continuously. Sound from the heart is called, “lub-dub”, and it happens during the cardiac cycle. This sound is made by the closing of the heart valves. Atrial systole is a contraction in the heart from left and right atria. When both atria contract same time, the blood pressure increases and the blood is sent to the ventricles. Ventricular systole is a contraction in the heart from left and right ventricles. When the ventricles are relaxed, it is called ventricular diastole. The atrial diastole is when the atria are relaxed. Both of them are known as the cardiac diastole. The cardiac diastole is the time that the heart relaxes after the atrial systole and ventricular systole to prepare refilling. The human vascular pathway consists of two circuits, the Pulmonary and the Systemic. The Pulmonary circuit is involved in the exchange of gases in the lungs. Blood flows from the right ventricle of the heart into the pulmonary artery. From here, it branches both left and right directions, making it's way toward the lungs. Once it reaches the lungs, carbon dioxide is released and oxygen is taken in, both in relation to their concentration gradient. In this case, some carbon dioxide remains in the blood and some oxygen remains in the lungs. However, under hyperbolic conditions, such as in a hyperbolic oxygen chamber, the level and pressure of the oxygen is so high that a much larger amount of oxygen is consumed by the blood, forcing a larger quantity of carbon dioxide out of the blood. The oxygen level inside the blood and the oxygen level inside the lungs will attempt to balance out. When the oxygen level is seriously depleted in an environment, the body will produce more hemoglobin to decrease the oxygen:blood ratio and to provide more carriers for the oxygen molecules. In hyperbolic conditions, the oxygen without hemoglobin quantity will increase, while the hemoglobins will also fill to capacity. The blood then leaves the lung capillaries and travels down the pulmonary vein and enters the left atrium of the heart. The systemic circuit is involved in carrying oxygen rich blood to the body tissues and organs. The blood leaves the left ventricle and enters the right ventricle. The AV node of the heart signals ventricular contraction and the blood is moved through the aortic semilunar valve, into the aorta. The aorta is the largest and strongest artery in the body, branching into other arteries which spread throughout the body. The blood then returns through venules and veins to the superior and inferior vena cava before entering the right atrium. Five measurement techniques are used to examine circulatory system. Five techniques are electrocardiogram, sphygmomanometer, pulse meter, stethoscope, and pulse. It shows an ischemic heart disease. Sphygmomanometer (or blood pressure meter) measures the blood pressure. Manual sphygmomanometer is used with a stethoscope. Sphygmus means pulse and manometer means pressure meter in Greek. Samuel Siegfried Karl Ritter von Basch and Scipione Riva-Rocci invented it. Cuff wraps upper left arm at same height as the heart. An examiner inflates the cuff and listens to brachial artery with a stethoscope while he is releasing the cuff’s pressure slowly. A systolic blood pressure records the cuff’s pressure when sound begins again. A diastolic blood pressure records the cuff’s pressure when the sound is not heard anymore. Stethoscope is used for listening auscultation (internal sounds in the human body). The examiner uses it to listen to the heart sounds and breathe sounds. Because it allows hearing auscultation, the examiner uses it with the sphygmomanometer to hear blood flow. Pulse is the simplest measure technique. When the arteries throb by heart beat, the pulses can be felt. A person can feel the pulses from carotid artery (neck), radial artery (wrist), popliteal artery (knee), brachial artery (elbow), and posterior tibial artery (ankle joint). Normal person has 60 to 100 beats per minute (BPM) pulse rate. When he exercises, the pulse rate increases about 200-220 BPM. Pulses help to find artery diseases. Giant cell arthritis is occurred by absence of the pulses at the skull. Peripheral artery occlusive disease is occurred by decreasing the pulses at the limbs. ↑ 2.0 2.1 2.2 Purves, William. Life the Science of Biology. 2005. Couriers Company Inc. p 941. ↑ 3.0 3.1 Purves, p 942. This page was last modified on 5 July 2016, at 16:53.